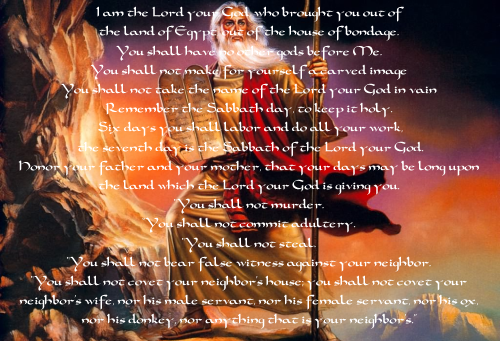 The Ten Commandments in the New Testament The longest chapter in the Bible is an extended praise of God's Word and law. "Great peace have they who love your law, and nothing can make them stumble," it tells us. "I wait for your salvation, O LORD, and I follow your commands. I obey your statutes, for I love them greatly" (Psalm 119:165-167, NIV). If only the whole world would view God's law in that light! But, to our shame, the Ten Commandments have been rejected as the standard of human behavior by our society. Even many who profess to follow Christ today treat them as irrelevant because they have been taught that God's law was abolished at Christ's death. Does it matter whether we obey the Ten Commandments? Finding the answer from the Biblical perspective. The person then asked exactly which commandments Jesus meant. Did He have the Biblical Ten Commandments in mind, or was He referring to the many extra biblical dictates taught by other religious leaders? Jesus left no doubt. When asked which ones, Jesus responded: "You shall not murder," "You shall not commit adultery," "You shall not steal," "You shall not bear false witness," "Honor your father and your mother," and "You shall love your neighbor as yourself" (verses 18-19). He briefly recited half of the Ten Commandments. He then quoted another command, from Leviticus 19:18, that summarizes the intent of the Ten Commandments and confirms the validity of the rest of the law. He was clearly referring to the law of God, not to the restrictions added by certain other religious leaders (Matthew 15:1-3). "Do not think that I have come to abolish the Law or the Prophets; I have not come to abolish them but to fulfill them. I tell you the truth, until heaven and earth disappear, not the smallest letter, not the least stroke of a pen, will by any means disappear from the Law until everything is accomplished. Anyone who breaks one of the least of these commandments and teaches others to do the same will be called least in the kingdom of heaven, but whoever practices and teaches these commands will be called great in the kingdom of heaven" (Matthew 5:17-19, NIV). In a similar setting Paul markedly told those judging him that He had continued to use the Old Testament Scriptures as the authority for his beliefs: ". . . I confess to you, that according to the Way which they call a sect, so I worship the God of my fathers, believing all things which are written in the Law and in the Prophets" (Acts 24:13-14). Accusations--then or now--that Paul taught against the law of God are fallacious. Even of his preaching to the gentiles, He said, "I will not venture to speak of anything except what Christ has accomplished through me in leading the Gentiles to obey God ..." (Romans 15:18, NIV). Paul kept the commandments of God. He taught them to Jews and gentiles alike. In making our decision, we should remember Jesus Christ's words: ". . . If you want to enter into life, keep the commandments" (Matthew 19:17). God admonishes us to consider our choice. "See, I have set before you today life and good, death and evil, in that I command you today to love the LORD your God, to walk in His ways, and to keep His commandments . . . I have set before you life and death, blessing and cursing; therefore choose life, that both you and your descendants may live" (Deuteronomy 30:15-19). The Confession, "JESUS IS LORD" If the confession "Jesus is Lord" bore such full and weighty content within the context of primitive Christianity, then the question next arises, what was the practical significance of this confession for the life of the church? What place did it occupy in the lives of early Christian believers and worshiping communities? The New Testament makes several points clear. Do you obey the Biblical Ten Commandments and is Jesus the Lord of our live? Remember the great words of our Lord, "if ye love me, keep my commandments". John 14:15. How long shall we obey the Commandments, and will they become no longer valid or obeyed? Know therefore that the LORD thy God, he is God, the faithful God, which keepeth covenant and mercy with them that love him and keep his commandments to a thousand generations; - This verse teaches us that the law is valid and we should apply them today. The Love of God and of neighbor is the summary from the law and prophets. 33 And to love him with all the heart, and with all the understanding, and with all the soul, and with all the strength, and to love his neighbor as himself, is more than all whole burnt offerings and sacrifices. The understanding of love and of the commandments gives one great understanding: "Thou art not far from the kingdom of God. Make Jesus Lord of your life." The law is fulfilled by love. Eating Pork and Shellfish What is the relationship of good health and eating pork and shellfish? The scientific evidence is shocking. Flee like a bird to your mountain.